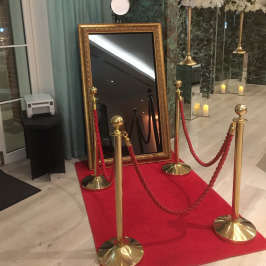 The latest addition to our photo booth range is our beautiful mirror booth. Just like our standard photo booth, for every hire period you have unlimited instantly printed photos for you and your guests to take home, an online gallery so that photos can be electronically downloaded & an abundance of personalization options. You can choose to have one larger single print or 3 or 4 smaller photos on the one print. 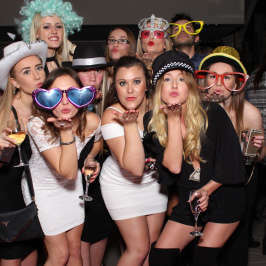 The main difference between our mirror booth and photo booth is that the mirror will take full length images as opposed to head and shoulders in the photo booth. So ladies & gents now have a chance to show off that entire outfit! Also the mirror booth can have a large group in the photos as you can stand in front of the mirror in an unconfined space. Our mirror booth is the original high tech innovation from the USA with all the latest software available hidden inside. Externally it is a beautiful, wide gilt edged mirror that looks like it belongs in every venue! The mirror is full length – all the way to the floor – we never use the mini mirrors! It is suitable for every event as a glamorous & fun way to capture unique memories from your special occasion. We set the mirror booth up together with red carpet & gold posts with ropes, everyone will be a star at your event! The optional customization is infinite; we will tailor your photos printed to suit your wedding or party theme. Add your choice of colours, style of images and your names to the photos so guests will always remember your special event. Anything is possible! We can include logos & brand messages for corporate events & use company colour schemes to enhance the photos for your clients. The mirror booth can be tailored for you to include animations to instruct a countdown for each shot & can even use gesture & noise activation. With our box loaded with fun props guests will have such fun posing in the mirror.